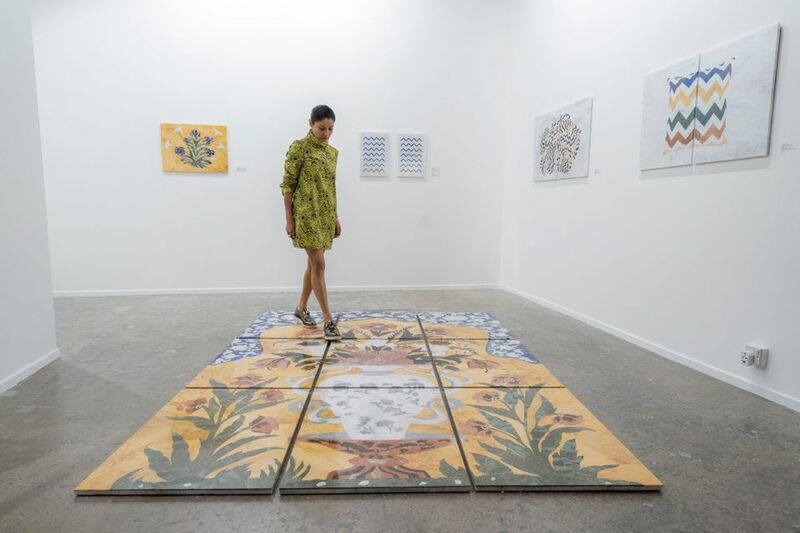 Art Dubai (until 23 March) is a gateway fair, one of the very few international art fairs in that vast geographic swathe from Delhi across to Lagos. For many enmeshed in the US- and Euro-centric art market, it provides a first encounter with not only the Middle Eastern scene, but also that of the wider Middle East and North Africa (MENA) region as well as South Asia and up into the Caucasus. While a few international big guns exhibit—Victoria Miro, for example, and (new this year) Sprüth Magers—adding a blue-chip seal of approval in the eyes of some, it is those galleries and artists seldom seen at other fairs that are the real reason for coming here. Internationalism, after all, often comes at the cost of cultural distinctiveness and originality. 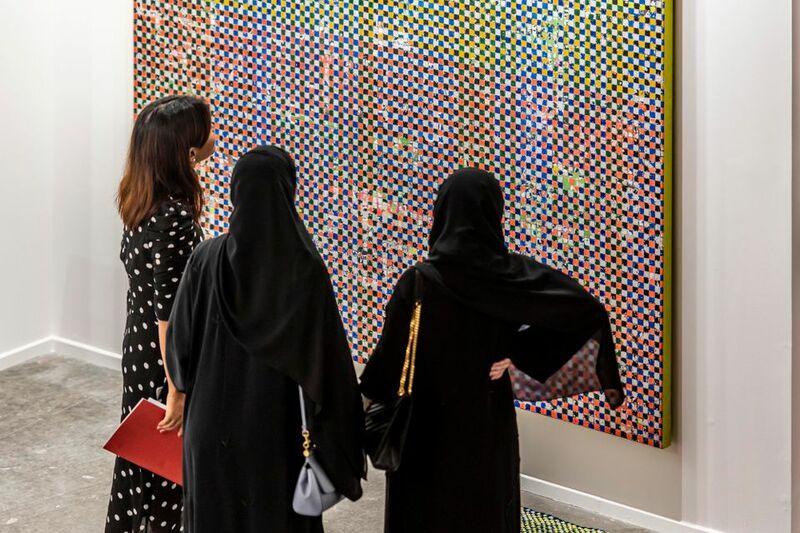 This year Art Dubai has gone on the curatorial charm offensive, inviting over 50 museum representatives to the event—the highest number ever, says Pablo de Val, the fair’s artistic director—though the fact it is also a Sharjah Biennial year provides extra cultural carrot. One curator in international contemporary art from the Art Institute of Chicago says she is in the Middle East for the first time—she is not alone. One thing the fair tries to counter is Dubai’s reputation as a cultural desert, simply a city of vacuous shopping malls and luxury hotels (although, admittedly, it is held in one of the latter). Befitting de Val’s concentration on the Global South, the second iteration of the Residents section brings artists from Latin America to work in either Dubai or Abu Dhabi for one to two months. However, both artists felt compelled to address the issue of migrant labour in the work they produced. “I felt emotionally attached to the struggle of the people who come here and have to bust their asses to make it work—those people who work on the sites all day, where do they go?” Martin says. For the Brazilian artist Luiz Roque (exhibiting with Mendes Wood), part of the reason for accepting the residency was to escape Jair Bolsonaro’s far right Brazil, which is “like living in a bad soap opera—we don’t know what he will do or say next.” In his video, Zero, produced in Dubai, depicting a dog aboard a private jet flying over the desert, Roque chose to depict a dog not a human, not least because his work often looks at LBGTQIA issues—using an animal meant he avoided the need to self-censor in this conservative society. Roque’s video, Zero, is priced at $8,000 (edition of five plus one artist’s proof) and therefore in line with much of the work on offer at Art Dubai—the vast majority is priced between around $5,000-$50,000 or $100,000, with a few pieces edging further into six figures. As de Val himself says, the litmus test remains the fair’s ability to produce sales and, as numerous Dubai-based galleries say—off the record—the city’s economy is in the doldrums and business is slow (though run a Google News search here and, naturally, the state-controlled press will tell you all is dandy and that the hotels are always "fully-booked", even when strangely devoid of guests in reality). Yet at the fair, sales appear to be decent, even if not necessarily to dirham buyers. There is never going to be a flurry of first day sale reports here—as Glenn Scott Wright of Victoria Miro says: “There’s a slower pace compared to other fairs like Frieze and Basel.” But the gallery still had a “good start to opening day with several confirmed sales of works by Do Ho Suh, Alex Hartley and Idris Khan,” he says. “I’ve spoken to some curators who say they were just invited by the fair: they weren’t required to do anything in return. It feels convivial,” says Anne-Claudie Coric of the Paris-based Galerie Templon. “You feel you are at the centre of a world that is very un-European, very distinct.” By yesterday, the gallery had sold several sculptures by Chiharu Shiota (€30,000-€60,000) “whose installation at the new Jameel Art Centre [in Dubai] received a lot of attention,” Coric says. The gallery also sold pieces by the Indian artist Sudarshan Shetty (€25,000-€35,000) as well as Jitish Kallat ($6,000-$10,000) and Atul Dodiya ($15,000-$60,000), both of whom will participate in the Indian pavilion in Venice. Kristin Hjellegjerde, based in Berlin and London also had a good opening day, selling works for between around $2,600 and $18,000 including seven pieces by the Moroccan artist Yassine Balbzioui, along with pieces by the Pakistani artist Maha Ahmed and Soheila Sokhanvari, an Iranian born UK-based artist. The growth of African art galleries at the fair was Art Dubai's main PR message last year and it remains a strong presence, although Ghana's Gallery 1957 is (which exhibited for the first time in 2018) is notably absent this year. Addis Fine Art shares a London space with Tafeta, which specialises in Nigerian art. Exhibiting in the Modern section—whose integration into the main gallery halls was transformative in terms of footfall for the exhibitors—the gallery’s director Ayo Adeyinkahad chose to show an academic group of works by eight Modernist artists related to the Mbari Artists and Writers Club, founded in 1961 in Nigeria (side note: Mbari will be included in the Barbican in London’s exhibition this autumn, titled Into the Night: Cabarets and Clubs in Modern Art). By the end of preview day, the gallery had sold a sculpture by Ben Osawe, with an asking price of $12,500, to a collector from Beirut.